Masport is committed to quality and performance. We back our products. On offer is a full comprehensive warranty, so you know exactly what is covered. 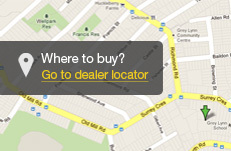 Click a section below to find out more about the various warranty options available. Please note that the warranties described below only apply to products sold in New Zealand and Australia. Depending on whether your mower has a Steel or Alloy chassis, and the type of engine your mower has, there’s a warranty cover tailored specifically for your new purchase. 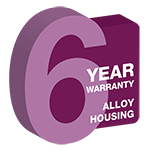 We offer to you an impressive 6 years warranty on all Alloy chassis. If you prefer a Steel chassis you’ll enjoy 4 years peace of mind. For both Alloy and Steel options, these come with either a 2 year warranty on ALL parts and engine, or a 4 year warranty with an I/C engine. Plus a LIFETIME HDPE Plastic Catcher warranty. With Masport it will last, we guarantee it. MASPORT HAS YOU COVERED. The Masport Lawnmower range fitted with IC Engines combines the benefits of top quality Masport lawnmowers with Briggs & Stratton Industrial Commercial grade engines. 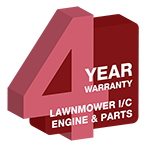 Masport lawnmowers with this engine carry a minimum 4 year warranty (For more information, click here). Masport unique features powered by a commercial grade engine... YOU CAN’T GO WRONG! Masport has been producing lawnmowers with aluminium chassis for over 50 years. You can probably still find one of these earlier mowers today tucked away in the back of a garage, collecting dust with a worn out engine but a housing that is still intact. Masport is so confident about the longevity and rust free advantages of its aluminium chassis we offer a comprehensive 6 year warranty. Briggs & Stratton 500, 550, 650, 675, 700, 725, 750, 850 series engines include a Starting Promise as listed. If they don’t start in line with the starting promise, return it to an authorised Briggs & Stratton engine service agent, and they will fix it for free**. With ReadyStartTM, there’s no need to manually prime or choke the engine on your mower, even from a cold start. Now even the least experienced lawn mower user can confidently start their mower. This engine should start on one or two pulls or it is fixed for free**. ** conditions apply, click here to find out more information. Masport build great barbecues and they feature comprehensive warranties. We back our barbecues, which is why some of them feature warranties of up to 10 year on their grill bodies. * 10 year Warranty is limited to the Grill body. warranty. Refer to the Masport Barbecue Warranty card supplied with your barbecue for more information. * 5 year Warranty is limited to the Grill body.